Why is there so much of gap between releases of Nakshatram (2017) and your last film Govindudu Andari Vadele (2014)? There are multiple reasons. I couldn’t decide on what kind of film I should be making. Though GAV was a reasonably okay film, I was not fully happy with it. I want to deliver a solid film, not in terms of box office parameters, but to my utmost satisfaction. Once we started shooting of Nakshatram, there were many issues like financial problems, dates of actors and demonetization. Tell us about genesis of Nakshatram story? I was stuck in traffic at Khairatabad junction. Lots of police officers like me because of Khadgam film. A traffic constable who was monitoring the traffic waved at me and I acknowledged him. He was wearing pollution mask and standing in summer heat. All the people around were looking at him irritatedly because he was stopping them. If he were not there, the traffic would have been stuck for several hours. He was doing a thankless job. I started doing research on police department. We have seen common man’s point of view towards police so far in films. Now, I dealt police’s point of view towards common man and our society. Rs 4500 crores was the annual budget for police department in AP before it was bifurcated. Police system is created for safety and security of a common man. After allocating Rs 4500 cr of tax money to them to protect us, we still fear cops. There might be fraction of corrupt police officers in the system, still a common man is cautious to approach police. A sub inspector of police gets a salary of Rs. 30,000/-. How can he survive with such a meagre salary and at the same time he is doing such a dangerous job. He has to risk his life, if situation requires. If something goes wrong, we always blame police. I want to narrate a story where cops are shown in realistic light. At the same time, it shouldn’t be a dry film. Except for occasional films like Ankusam, we didn’t have proper cop film in Telugu. Our heroes are doing police characters in films. But the police characters in films are not becoming heroes. Films like Ardh Satya and Drohkaal did portray cops in realistic sense. Getting story of Nakshatram in a commercial format took me a lot of time. You gave a tagline in teaser - every police is a citizen and every citizen is a police? As per the law, every citizen has a right to report a wrongdoing and get the people responsible for that arrested. It’s our social responsibility to be a watchdog for the society. Tell us about prime characters? Sundeep Kishan character’s elders were in police department for 3 generations. His great grandfather worked as hawaldar in British Raaj. His grandfather worked as a constable. His father has worked as head constable. Aim of Sundeep Kishan is to become an SI. Only SI (sub inspector) and above are awarded stars. The story is about whether Sundeep Kishan succeeds wearing a star (Nakshatram) on his shoulders are not! There is a dialogue for Prakash Raj in the film - Nela meda nadiche Nakshatramera police. Sai Dharam Tej plays the role of Alexander who is a daredevil in his work. Prakash Raj plays a police officer who is about to retire. Prakash Raj inspires Sai Dharam Tej in the film. Tell us about songs of Nakshatram? I concentrated more on songs of Nakshatram. There are eight songs in the film. Six songs come during the narration and two songs come in the background. One song (Naa pedaviki nuvvante pranam) is a tribute to Ilayaraja. Akon kind of wrap song. Another western style song. A Telangana folk song. Did you do anything special in terms of making for this film? Yes. It’s sound mixing. Sound mixing is about blending background music, sound effects and dialogues. Generally, most of the sound erupts from the source towards screen in theaters. For the first time, I tried to get sound from all the directions. If you watch the film, you would understand what I am talking about. If our films were not mixed in such a way, why are we having sophisticated sound equipments as Dolby Atmos in theaters? We have the right equipment, but we don’t give enough time in post-production for sound mixing. Except for a few Bollywood films, we don’t do it properly. For example, sound mixing for such a big film like Govindudu Andari Vaadele was done in 3 days. Sound mixing of Nakshatram was done in one and half month. It took 40 days to score background music. Background score was done in symphony style in a few vital scenes. Since police is represented musically by trumpet, we have used trumpet in many scenes including romantic ones. Whole archestra is designed with trumpet as base. Nakshatram will offer a different experience on music front. 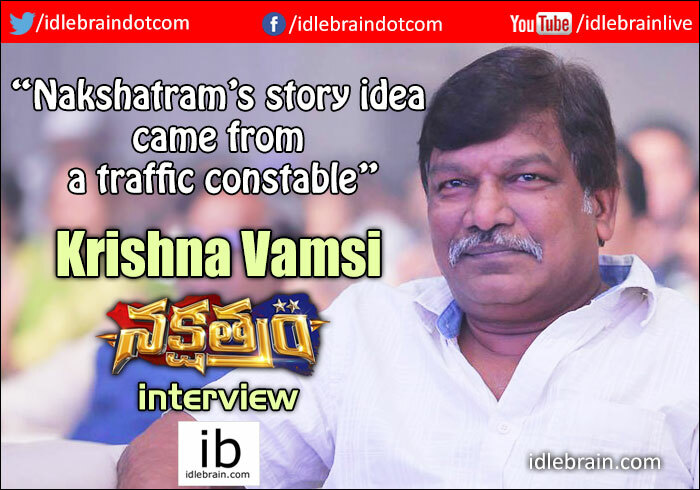 Lakshmi Narayana who worked for Shiva has done mixing for Nakshatram. He is a regular for Maniratnam and Shankar’s films. I heard that Nakshatram is done on first copy basis. Generally directors tend to save money by delivering movie in less than what it is budgeted for. But Nakshatram went over budget? Nakshatram went over budget by 30% and producers gladly paid for it because of the value I brought to the film. Sai Dharam Tej, Prakash Raj, Sivaji Raja and Tanish did the film for free. I asked for 7-days call sheet when I narrated script to Sai Dharam Tej. He ended up working for 28 days without asking for one paisa. I paid ¼ of their market price to Regina and Pragya. I got everything like locations, labs and studios for discounted prices. We spent a lot on production, but very less on remunerations. If we had to pay fully for the actors, Nakshatram would be a 30 crore film. Saving money and getting benefitted in first copy basis films is a cheap thing. If I had to earn money, I will earn it royally by making my films work at box office. You do so much of research while preparing a subject and you have so much of deep insight in the stories you deal with. But sometimes, it doesn’t get translated on the screen like Mahathma, Sri Anjaneyam etc? There are so many aspects that goes into filmmaking. You have complete authority over it when you write your script. When you start shooting the film, you need 200 people contribute to it. Each of them should believe in the same vision and work with the same passion. Money is a big factor. Sometimes, you are forced to okay the scene though you know that it’s substandard. Sometimes, an actor might not portray what I wanted him/her to portray. At times, we may be forced to shoot a 2-days planned scene in just 2 hours. Sometimes, I know during the making of the film itself that it’s not working. I try to revive patient even when operation is failing. Your actors always walk away with honors irrespective of the fate of films? Yes. I make them to connect with scene. I try to create a personal connection towards the conflict point in the film. Personally, I am a very bad actor. I can’t act. All the stories and situations in films are the ones we generally get across in our real lives. We don’t do science fiction, alien subjects in Telugu cinema. Since we do mostly social subjects, I try to connect the human element to the actor. For example, I told Ram Charan to think about his grandfather Venkat Rao garu when he interacts with Prakash Raj in Govindudu Andari Vaadele film. Once you get a personal connection, an actor will channelise his emotions and makes sure that he does an excellent job. Relatability is the key for genuine performance. Most of Telugu films are dialogue driven. There are so many punch dialogues for actors in films. Mostly, there is no thinking goes in for an actor when he is uttering such dialogues because commercial films are dialogue oriented. When I get personal connect with characters for actors in my films, it gets passed on to audiences when they watch actors perform. That’s the reason why actors in my films walk away with honors. Ramya Krishna has shot to nationwide fame with her excellent portrayal of Sivagami character in Baahubali? She has been laying low past Narasimha and she suddenly got such a character of life time? Here, we need to look at two things. One is journey and the other one is result. She was very excited when she played Sivagami character. That gave her immense satisfaction as an actress, which is what she looks for in career. The fame and recognition gives us an extra kick. But, we at film industry, enjoy the process as results are not in our hands. Right now drugs issue has caught up with film industry. We don’t know if its a real storm or storm in a teacup? It’s just a media’s creation. Media has played an irresponsible role by sensationalising it. These celebrities are not caught with drug and we don’t know whether they took drugs or not. The sensationalizing media reminds me of Oliver Stone’s film Natural Born Killers film. The whole thing is just a storm in teacup. What do you do when you are not watching films and reading books? I go for rides. I visit Prakash Raj’s farm as I am interested in agriculture. I go to Chennai and play with my son. I am a loner by nature. You are not a kind of guy who boasts off about commercial result of the film before the release. What’s your gut feel about the film? I never said positively about commercial results of any of my films in interviews given prior to film release. But I am 100% confident about commercial success of Nakshatram. The audience will develop a soft corner towards police after watching this film. A few problems like drugs and bombs are dealt in the film. Tell us about your next film? It depends on commercial result of Nakshatram. I am very confident of Nakshatram’s success of at box office. Otherwise, it’s going to be a struggle for survival.